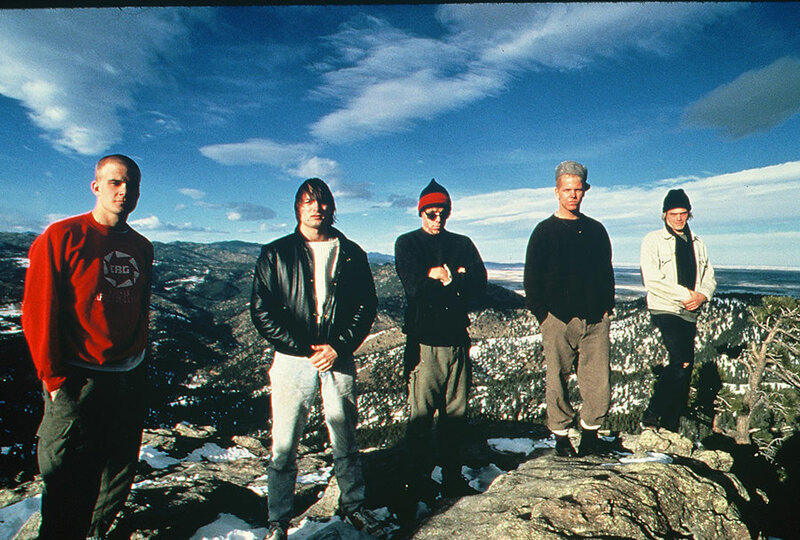 Emerging out of the burgeoning Colorado music scene, the Samples grew to become one of the most popular touring bands of the early 1990s. It was no fluke. In 1987, Sean Kelly (vocalist and lead guitarist) and Charles Hambleton (acoustic guitar, mandolin and banjo) played their first gig at a frat party in Vermont. They found bassist Andy Sheldon, who had played with Kelly since high school. They put a drummer-wanted ad on a campus bulletin board, which was answered by student Jeep MacNichol, and met keyboardist Al Laughlin (a Boston transplant) at a party. The members took their name for their survival technique of making meals from free food samples at local supermarkets. The Samples played their first show in front of a handful of people at Tulagi nightclub on Easter Sunday 1987. The band soon became a sensation in local clubs, taking over rooms like J.J. McCabe’s and the Boulder Theater. The group then went on a North American tour and built a solid grassroots following. “When bands from New York or Los Angeles or San Francisco try to tour outside of those cities, they rely on national promotion machines. We happened by ourselves,” Kelly said. “In Boulder, our fans were supportive students. They would buy our tapes, and during summer vacation they’d spread out across the country to go home. We recognized people from Boulder in every strange little bar in every university town we played. We got letters from Texas and California, and we heard stories of Samples tapes playing in a hotel on an island off of Greece and in a bar in Nepal. The Samples played atmospheric pop, mixing rock melodies and reggae rhythms. Most of the band’s songs were written by Kelly, who frequently referenced rain, oceans and other environmental aspects. Already popular in concert, the band chose to release 5,000 copies of The Samples on its own. With the initial shipment sold out, the quintet signed a major label deal with Arista Records under its own terms. The situation should have meant wide distribution, promotion and possible financial stability. It never developed. The Samples sold over 50,000 copies nationally, but when asked specifically to write “hits” to push to radio and MTV, the band discerned the label’s meddling and opted to be dropped. Hambleton left the band. In four years, the Samples had risen from a freethinking Boulder band to a group with national impact, opening for UB40, the Wailers and Johnny Clegg & Savuka. They found new ways to distribute product to their audience, and a 7,000-person fan club gave them the means to spread the word. To take control of their career, the Samples were the charter act signed to W.A.R.? Records, a tiny Boulder-based operation founded by disenchanted refugees from the corporate atmosphere. W.A.R.? distributed directly through stores that fell through the cracks of a major label’s network. Through constant roadwork and such beguiling tunes as “Underwater People,” “Did You Ever Look So Nice” and “We All Move On,” the Samples made the leap to appearing on the H.O.R.D.E. tour and The Tonight Show. Kelly wanted the band to be a part of a nationally recognized Denver/Boulder music scene. The Colorado quartet’s fourth CD, Autopilot, debuted at No. 1 on Billboard’s national Heatseekers chart, listing the best-selling titles by new and developing artists. The Samples had managed great success without the backing of a big-time record company. Yet when the Samples’ contract with W.A.R.? expired, they looked to sign with a major label for the second time in their career. The band had a brief stint at MCA Records, but the Outpost CD did poorly (a changing of the executive guard at the label didn’t help matters). MCA paid off the Samples contract. Laughlin battled a substance-abuse problem, and he and MacNichol departed the band. Kelly introduced a brand-new Samples featuring Rob Somers, the acoustic guitarist who had accompanied his solo projects. In 1997, the Samples rejoined W.A.R.? and released three more albums, then began to issue recordings on their own. There were numerous personnel changes with the exception of Kelly, the only remaining founding member. The rebirth as an independent band rejuvenated the group’s career in the 2000s.